He has won every major title the sport has to offer, whatever the future holds his name stands tall amongst the greats; he does not have to prove himself, there is nothing missing from the trophy collection. Ma Long is already a legend of sport. However, his name does not appear on the entry list for the first Seamaster ITTF World Tour tournament of the year, the Hungarian Open, which commences in Budapest on Tuesday 15th January. Does that not suggest he is preparing for greater challenges ahead; making sure he is fully recovered from injuries which forced his withdrawal from major events at the end of last year. A fit Ma Long and in 2019 he could secure unprecedented success. Notably in March 2015, he regained top spot on the Men’s World Rankings, a position he had first held in January 2010; he retained that billing throughout 2016 and 2017 but when the new scheme came into place in January 2018, he appeared at no.7, he finished the year at no.11. Now here is one challenge for Ma Long; if he can reclaim the coveted top spot on the rankings for just one month, he will be become the all-time leader in terms of the time period at the head of the list. Accepted from a totally different era, when the order of merit was decided by committee decision, he is just two days behind colleague Zhuang Zedong; most impressively Zhuang Zedong headed the order for 1,947 days; currently for Ma Long it is 1,945 days. Just two days behind and could two wins see him head another list; such a possibility depends on a certain Vladimir Samsonov of Belarus. 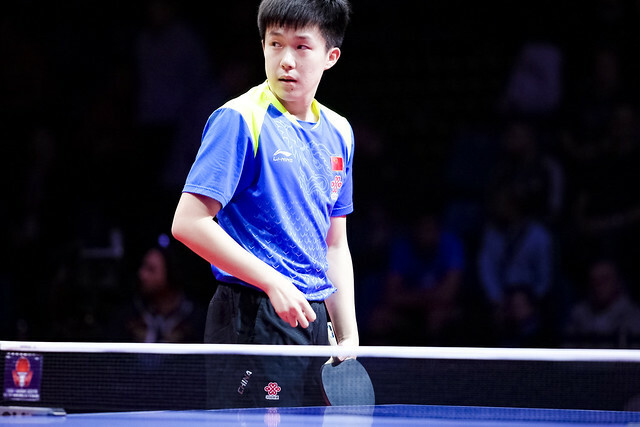 Currently, at open international tournaments on the ITTF World Tour, Ma Long has 26 Men’s Singles titles to his name, Vladimir Samsonov has won 27 such events. Don’t count out Vladimir Samsonov adding to that list; his name appears on the Budapest list. Equally, there is the challenge presented by the Liebherr 2019 World Championships; can Ma Long win for a consecutive third time? It is unfair to compare with Hungary’s Victor Barna who won four times in a row between 1932 in Prague and 1935 in London, in those days the tournament was held on an annual basis; since the event has been held on a biennial basis, the only player to achieve the feat of three in a row is Zhuang Zedong. He won in 1961 in Beijing before repeating the feat in 1963 in Prague and 1965 in Ljubljana. Three wins; that number is very much in evidence for Ma Long in 2019, success in the Men’s Singles final at the end of year Seamaster Grand Finals would be the sixth time he has won the title, three times more than his nearest rival, colleague Wang Liqin. Meanwhile, gold at the end of September in Chengdu at the Liebherr Men’s World Cup would mark his third top prize in the event. It would put him alongside Vladimir Samsonov and colleague Wang Hao, one behind four times winner Ma Lin, also from China. However, should he succeed in Budapest and Chengdu; it would mean that he becomes the only player on two separate occasions to have held the titles of Olympic Games gold medallist, World Champion and Men’s World Cup winner at the same time. Compatriot Zhang Jike, is the only other player to have achieved the distinction on one occasion. In 2011 in Rotterdam he was crowned World champion before later in the year winning the Men’s World Cup in Paris; in 2012 in London he secured Olympic gold. Three years later in 2015 in Suzhou, Ma Long became World champion, he then clinched the World Cup in Halmstad, before in 2016 in Rio de Janeiro becoming Olympic champion. No titles to his name for over six months since winning in early July in Shenzhen at the Seamaster 2018 ITTF World Tour Kaisa China Open; now Ma Long is breathing fire, in 2019 the Dragon is surely set to roar.